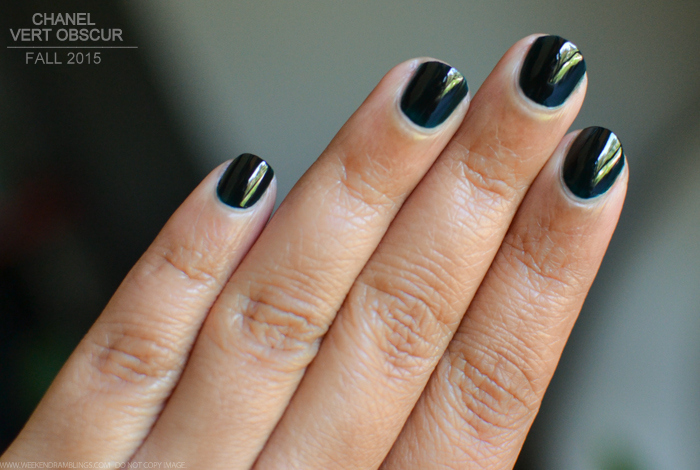 On the nails, Vert Obscur is a dark, almost-black color with a glossy finish. 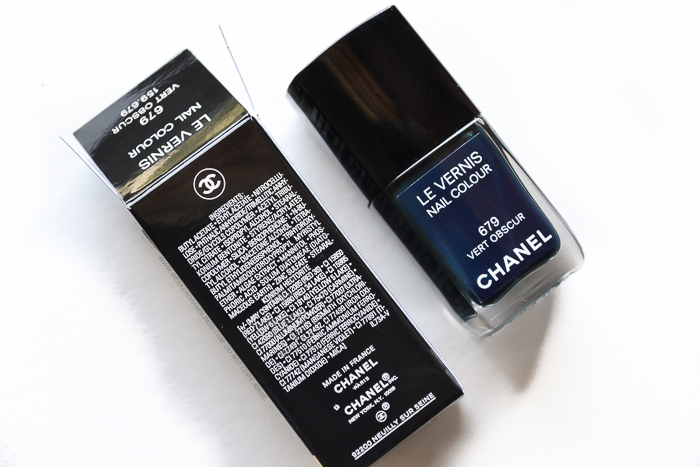 Depending on the light, the color has a hint of teal to it, and it's almost like a darkened version of the Chanel eyeliner in Feuilles, also from the Fall 2015 collection. It took me 3 coats to get an opaque, even finish, but my nail polish application skills are about average at best, and with a good base coat and steady hands, you could probably get away with 2 coats. The teal-green color looks darker and more like black with each additional coat, and on my nails with 3 coats of polish, Vert Obscur looks almost black under most lighting. There is a hint of teal to it under daylight, but I won't be too surprised if most people assume it's black. No base/top coat used in the photo. I love dark, almost-black (and black) nail color, and I have somewhat of an obsession with Chanel nail polishes, so in my very biased opinion, Chanel Vert Obscur is perfect for fall. 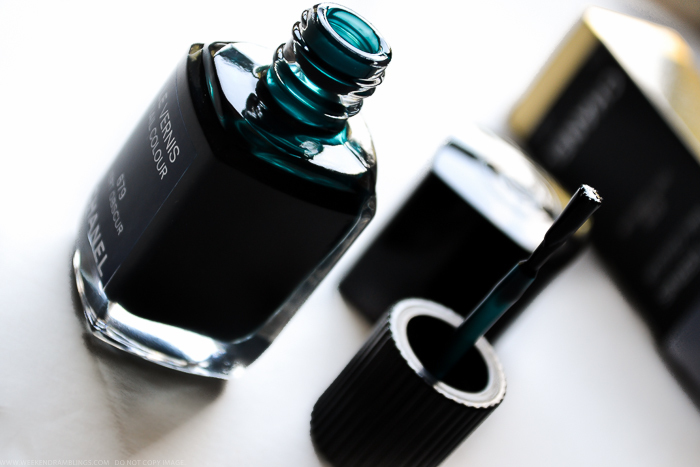 I would assume that since it borders on black, a lot people might be put off by it, but given all the hype about Chanel Black Satin, I am sure Vert Obscur will be spotted on a lot of stylish nails this year. The color lasted about 3-4 days on me without much chipping - which is good by my standards - and I didn't use any top coat or base coat while testing this out. I would recommend using both, though. Chanel nail polishes generally don't stain my nails, but using a base coat gives a smoother base and added protection to the nails. This polish definitely needs a top coat to keep the glossy effect intact. 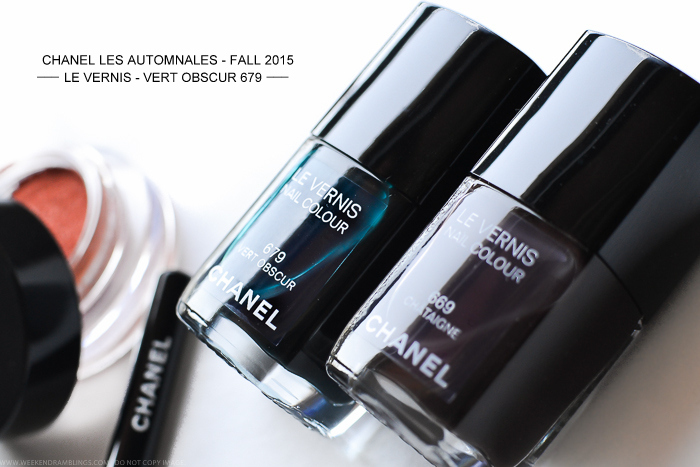 Overall, Chanel Vert Obscur is a lovely addition to my small Chanel nail polish collection. Is it a must-have? 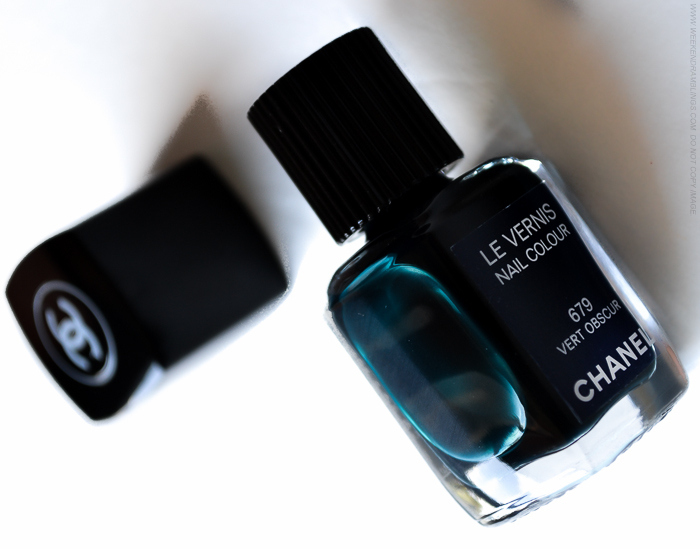 Not really a question if you are a Chanel beauty addict, but if you aren't as obsessed with Chanel nail colors, Vert Obscur might not be a necessity. That is soooooooo beautifully captured Rads.